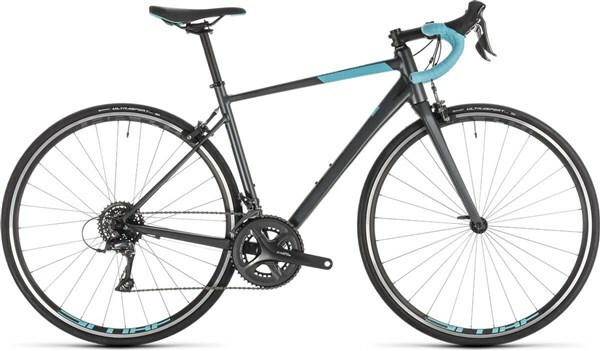 This Cube Axial WS 2019 bike is in excellent condition. Having never been ridden, it is showing no signs of mechanical wear. However, it has some cosmetic imperfections with damage to the front brake. Feel the need for speed, at least some of the time? The Axial should be right up your street. The high quality, lightweight aluminium frame is designed with comfort and efficiency in mind, complemented by a carbon bladed fork to help filter out road vibration. We selected Shimano's Claris groupset for its wide gear range and easy shifting - and it now features a lighter PressFit bottom bracket and Hollowtech-2 cranks. With Continental Ultra Sport 2 tyres on a CUBE wheelset with DT Swiss spokes and a saddle, stem and handlebar specially selected for female riders, you're fully equipped for any ride, wherever it takes you. A wide range of sizes means every woman can find the right fit, too - a versatile sports tourer with your name on it.